As you probably have gathered by now, British designer Tom Dixon is by far one of my favourite creators. I have written about his Clerkenwell exhibition and his Bronte Restaurant in London and I found out today that he has recently launched an office suite collection called Workspace… Imagine my joy! I was so happy to discover this as it means that I can passionately write about it all and in turn, hopefully, give you something to enjoy reading! One of the main furniture pieces in the office collection is the “Slab School Desk”. Using a traditional Victorian style of design that has been used for hundreds of years, Dixon has taken something practical and traditional and has created something contemporary. 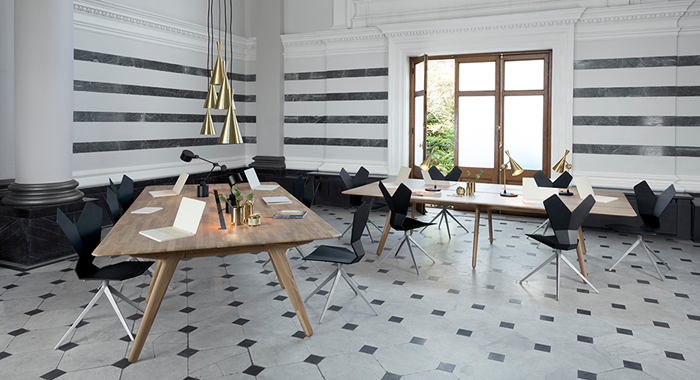 Constructed from solid oak, keeping to a traditional and durable material, the desks are softened by the implementation of round edges and understated proportions. These beautiful assets also ensure that they are adaptable to any workspace or any room, as a hotel desk or dressing table for example. The desks also come with a cable management hole and a groove for pens, accessories and even make-up! This all emphasises the link between beauty and practicality, creating an everlasting finish and style in true Tom Dixon fashion. 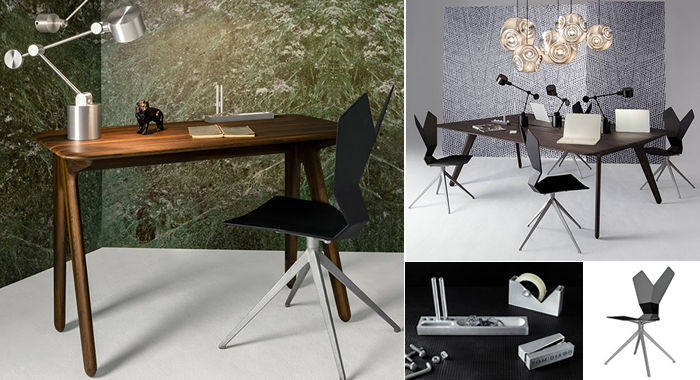 Of course, what better chair would be better than the “Y Chair” to complement all this? Simply amazing! Dixon, being the master of light design, has of course also introduced a desk light that fits right in: The Boom Task Light. 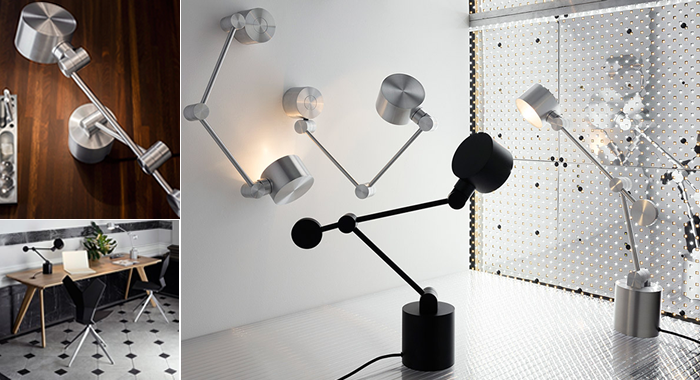 Taking inspiration from “generations of draughtsman’s chairs and machinist lamps”, the Boom Task Light has a sleek, simple design that makes a connection between elegance and machinery. The light shows that technology can also be aesthetically beautiful. The minimalistic composition is a great attribute of the desk, reflecting the same fashionable design. The cylinders on the lamp reflect the rounded corners of the desk beautifully, allowing both design choices to flow as one. This creates a primary feature in any room. Oh, did I mention that it is also gorgeous?! Like any fashionable outfit, no office would be complete without accessories! Dixon has taken every last detail into consideration when it comes to this collection and has even re-vamped his “Cube Stationary” range. 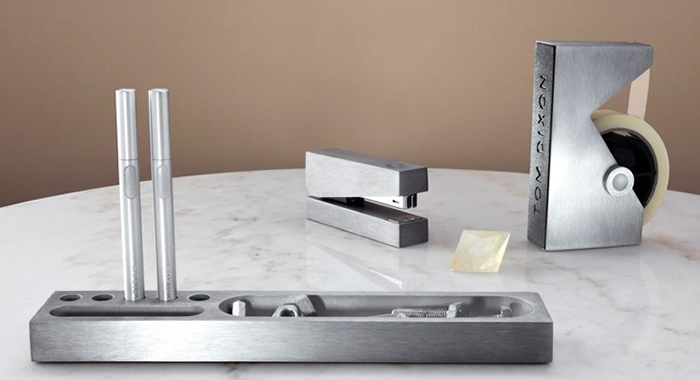 The simplistic, elegant style is transferred into the “Cube Alloy” collection. With stationary that looks this incredible, you’re not going to need anywhere to store them as you’re going to want to show them all off! Moving away for the dream of a “paperless office” Dixon seems to want to encourage us to continue with manual stimulation that an analogue life seems to provide in an office environment. The zinc alloy finish that has been incorporated creates a sense of “authority and permanence to any work situation”, which is a good mentality to have when working on something! The zinc element also flows from the stationary to the light fitting, possibly making the connection between writing that is achieved by a person, to light that is achieved through technology. The office collection seems to create a sense of “immortality”. From a traditional style desk, a fashion that has become everlasting, to zinc alloy accessories that are infinite and fit for the future, I think it is the flowing mix between the conservative and futuristic style that Dixon creates that takes my breath away. I’m truly in awe!